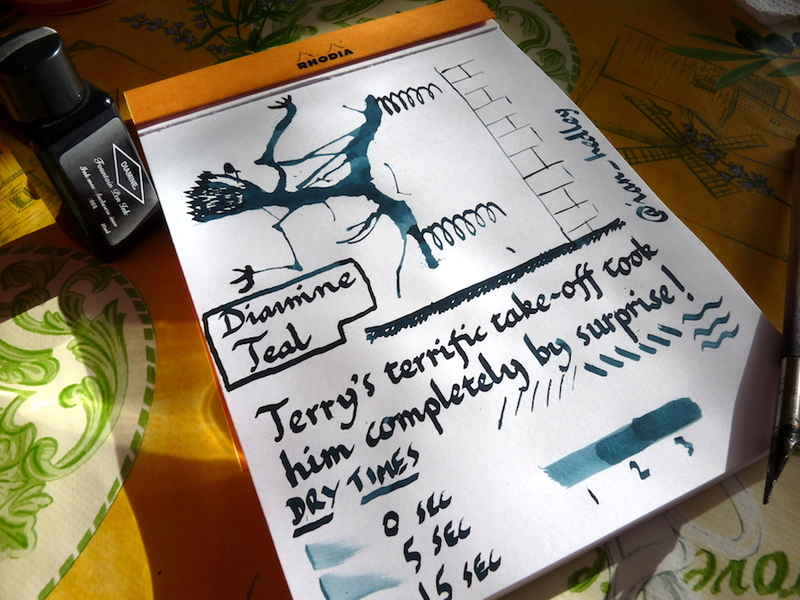 Diamine Teal ink review – Pens! Paper! Pencils! 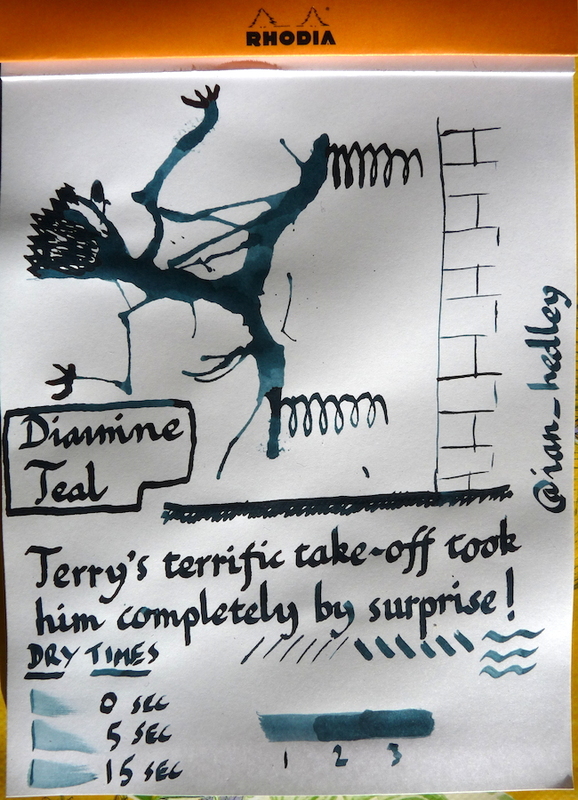 This is a lovely and unusually coloured ink. I’m not at all sure it’s actually what I’d consider ‘teal’, it’s much more a dark blue with the barest hint of green (if you squint a bit and look out of the corner of your eye, in the right light). I sometimes wonder about Diamine’s naming. However… it is a great colour. It behaves very well too. Here I am drawing the Inkling. Please ignore the dry times, I had far too much ink on the pen when I did them. It dries in a perfectly reasonable time. Also, I am using my camera rather than a scanner because my camera captures the colour much more accurately. There is some shadow in this picture but it does (on my monitor anyway) show the colour very well. Wow – not the color I expected to see either. It is even more appealing to me now! Hi Brad! I was so unsure of myself with this ink that even though I’ve been using it for months (it’s one of my favourites) after doing the review I went back and made sure I’d used the right bottle! And then I checked some swabs online. Whatever the colour actually is, though, it’s lovely! Nice, I bet the shading would take off if the ink was diluted a bit. It’s worth comparing directly to a blue to see just how much green is in it, e.g. It’s a lovely colour, well worth getting in the 80ml size. That’s a really good comparison. It looks a lot greener there than I’ve found it to be. I’ve seen it looking green like that in other reviews too. I wonder if the formula changed at some point. I’ll try some comparisons of my own. Thanks for sharing this. Thanks – that sample is from an old-ish mixed set of cartridges, but I have a recently purchased 80ml bottle, and the colour is consistent between the two.